Few things can relax you like some time at the spa where the relaxing atmosphere helps to drain your troubles away. It is not always possible to go to a spa for that relaxation you crave, but you can get that same feeling right at home. With some ingenuity and planning, you can turn even a small bathroom into your own personal spa. Best of all, it doesn’t have to cost you a lot. Customizing any room in your home is easy and affordable with the right designer; and we have one in mind for you. Since you may not have a lot of space, removing doors to the shower or bath area can help you create an airy, roomy looking bathroom. If on the other hand, you like having your bath area enclosed then consider using glass doors, light colors, and plenty of mirrors to give an illusion of more space. Using white, pale, or earth tone colors will also help to create the feel of a roomy bathroom. These colors are also popular in spas for their calming effect, so they are perfect for your own at home chill spot. Adding elements of blue will help to keep the area, cool and calming without being a sterile, stark white or other light color. Nothing says spa like candles. Arrange candles of different colors in the bathroom to help create the mood when you want to escape from the world for a while. If you love pleasant fragrances, use scented candles to help create that perfect spa atmosphere. Choose candles in cents that you enjoy and that promote a sense of calm and tranquility. Put in a nice potted plant if space allows. This can be as simple as a cactus in a small container or a nice palm in a pot in a corner. Plants that require a damp atmosphere are perfect for a spa environment. Consider using a potted peace lily, as they have beautiful broad leaves and bloom a nice white bloom throughout the year. Don’t be afraid to experiment with other types of house plants that will also add a splash of color and personality to the spa. Feel free to make the bathroom your own by adding some personal touches such as nicely framed prints or even a small fountain that you can turn on when you want the sound of water to soothe your senses. Add some petty bottles of bath gels and specialty soaps and other fancy toiletries. Getting a professional designer to help you make the best use of the space is a good idea. For one, they can come up with great storage ideas so that there is no clutter. This can detract from the atmosphere you are trying to create. They can take your idea and help you build on it to create a perfect spa right in your bathroom regardless of the space you have to work with. 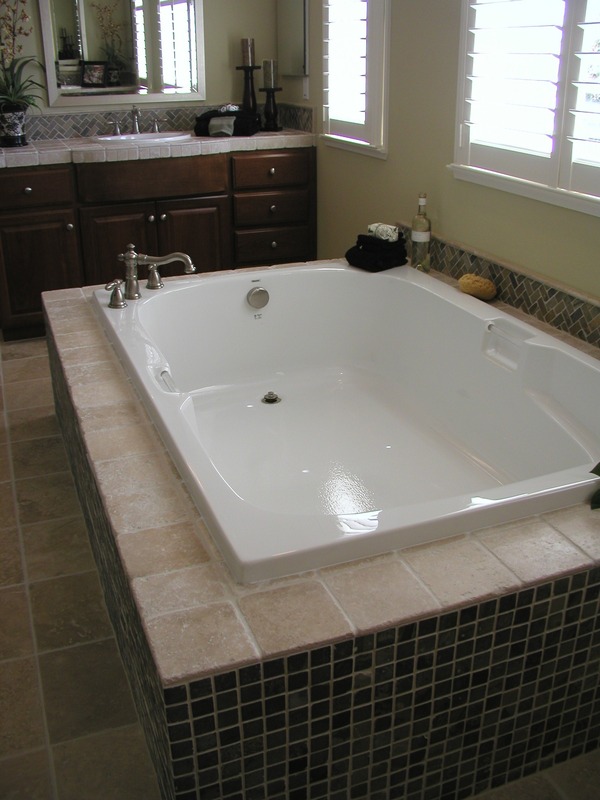 When you have your perfect spa design worked out, give us a call to start the bathroom remodeling process. We will also offer our expertise, help you find the best deals on materials, and complete the job within budget and on a workable timeframe.